Impressive hydrothermal features surround Rotorua on the North Island of New Zealand. 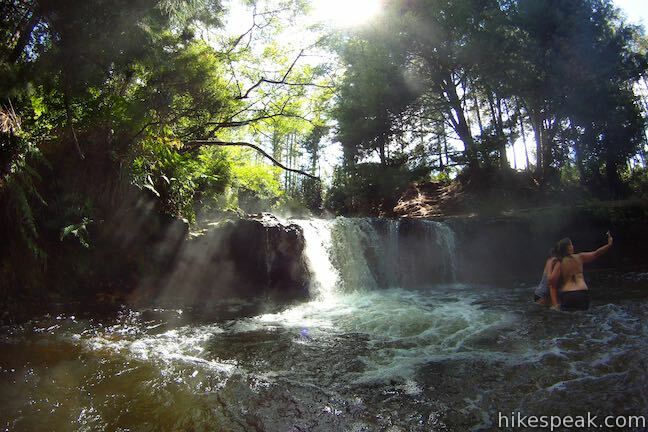 Kerosene Creek is one of the easiest to visit, and it’s also free. 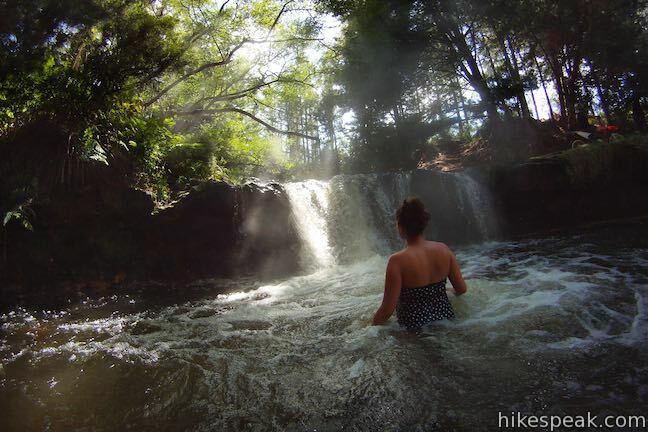 After a brief walk, hop in a steaming stream and soak in a pool below a short waterfall. 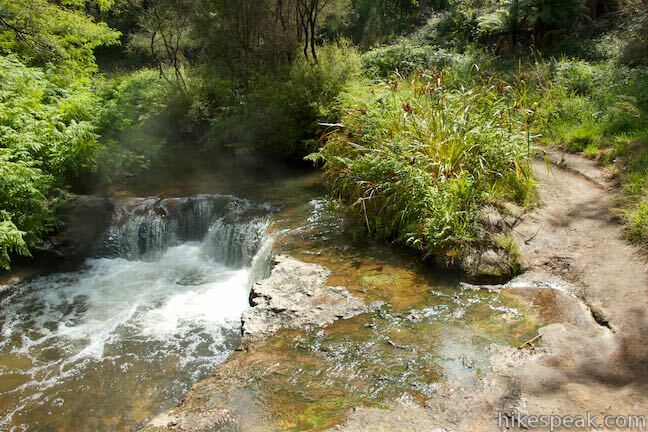 They don’t call it Kerosene Creek for nothing, but you can forgive the harsh small as you relax in this refreshing hot pool. Start from a car park along Old Waiotapu Road, about 28 kilometers south of Rotorua. 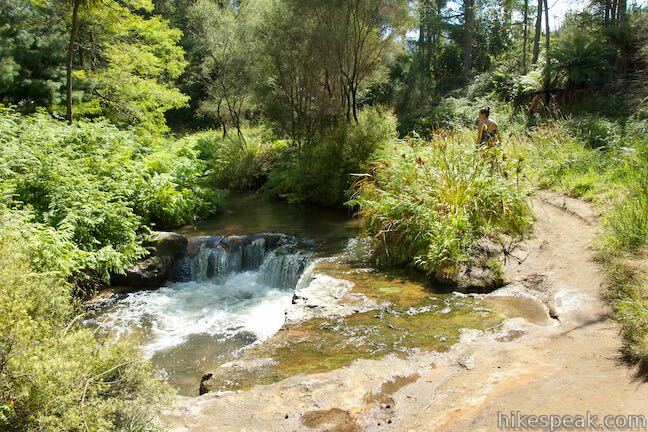 Rainbow Mountain Scenic Reserve is just across the road from the track to Kerosene Creek, offering opportunities to walk farther. 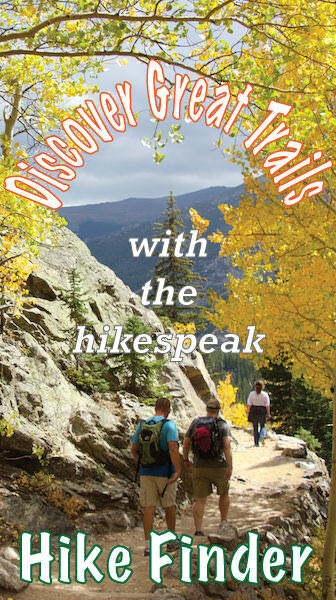 Venture down a dirt track through ferns, brush, and trees. Reach Kerosene Creek and continue downstream. 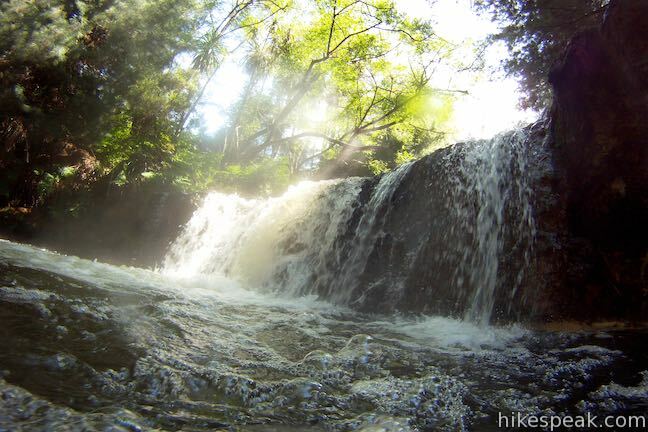 After 100 meters, pass a horseshoe-shaped cascade in the stream. This isn’t the destination yet, so keep walking. You’ll see steam rising from the stream, letting you know that you’re getting close. 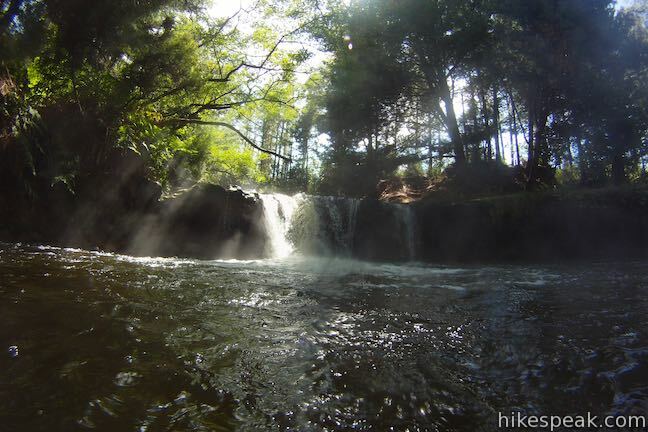 After just 170 meters of walking, arrive at a ledge alongside a taller crescent-shaped waterfall above a wide pool. This is the spot. Stairs have been carved into the rocky bank of the creek so that you can step down into the water. Wade out into the warm pool, which is about 30 degrees Celsius (85 degrees Fahrenheit). There are warmer spots and cooler spots. Sink your toes into the gravel on the bottom of the stream and you can find some intense heat. Walk you way up to the waterfall and see how close you can get. 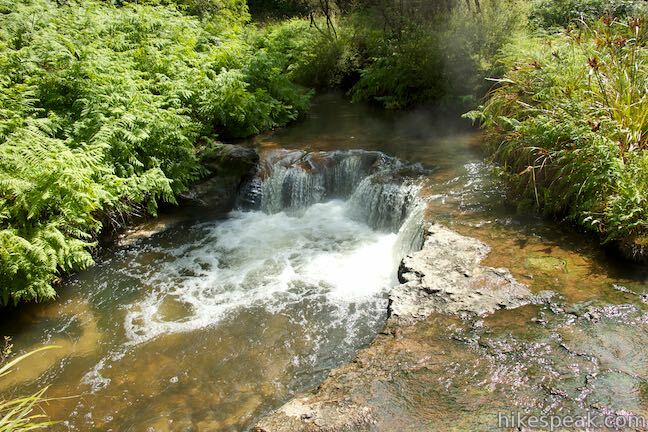 While the waterfall is less than two meters tall, it is a pleasant attraction that has carved out a tub in the stream big enough for all the visitors who make their way out to Kerosene Creek. 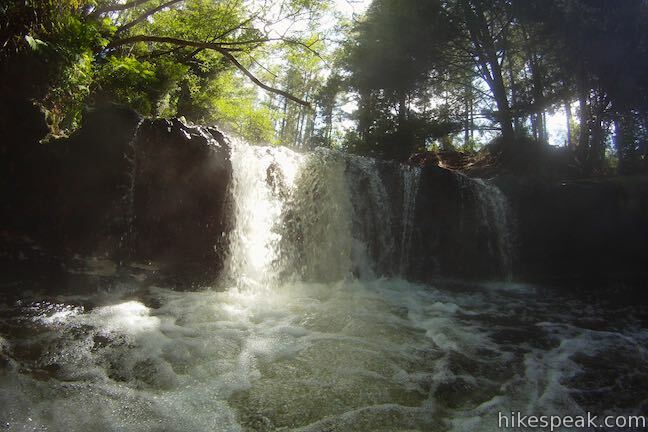 The deepest spot is just below the waterfall and other areas are shallow enough for you to sit on the bottom. 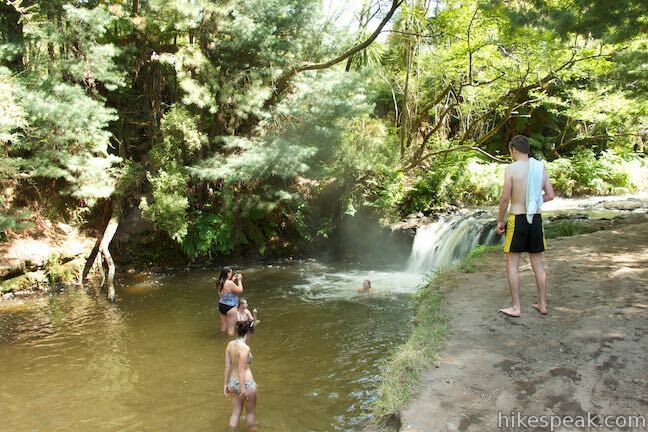 This is a natural thermal pool and the water has not been filtered to remove the sulfuric odors. Even if it stinks, the creek is still great. Don’t let the miasma stop you from enjoying this inviting natural attraction. As with all thermal hot pools, it is safest to keep your head above water. While not common in New Zealand, thermally influenced waters can contain nasty organisms that cause primary amoebic meningoenchephalitis and Legionnaire’s disease. The risk is very low, but swim at your own risk. 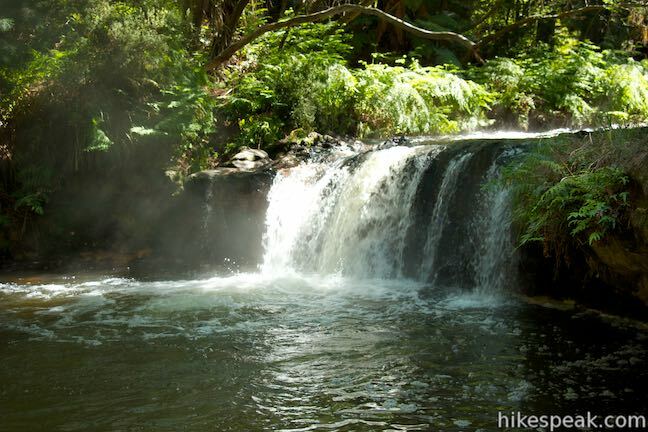 The walk to the hot pool on Kerosene Creek is 1/3 of a kilometer round trip (or 0.2 miles round trip). 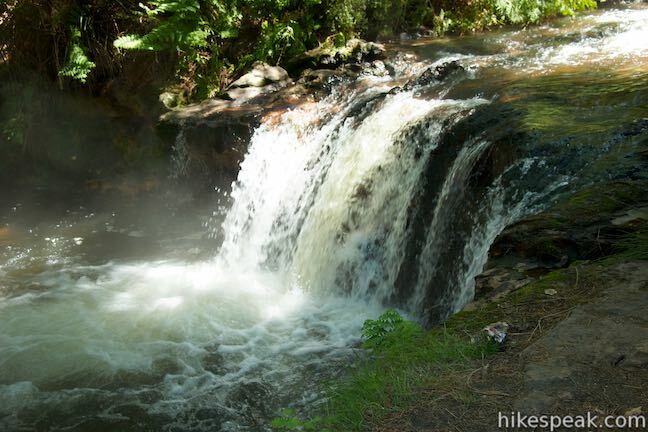 Visiting Kerosene Creek is free and no permit is required. Dogs and bikes appear to be allowed on the track as well. For another short walk that’s nearby, check out the 1-kilometer long stroll to a lookout over Crater Lake in Rainbow Mountain Scenic Reserve. Directions: From the center of Rotorua, take State Highway 5 (Thermal Explorer Highway) south from the intersection with State Highway 30A. Drive 26 kilometers on SH 5 and turn left on Old Waiotapu Road, which immediately becomes unpaved. Old Waiotapu Road is 1.2 kilometers south of the intersection with State Highway 38 and just past Lake Ngahewa and Rainbow Mountain. Reach a gate across the road after two kilometers and park in the turnout on the right next to the start of the track to Kerosene Creek. 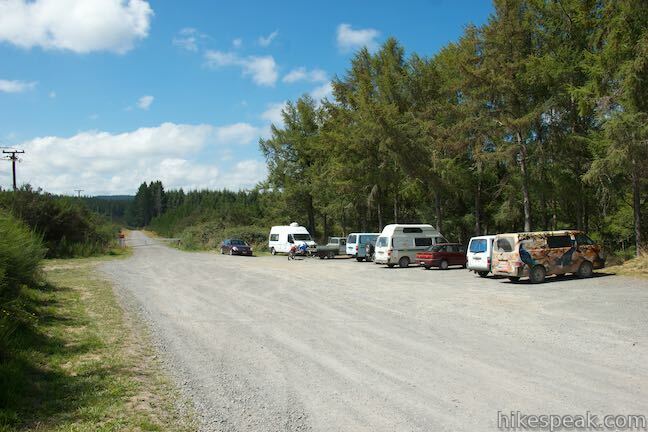 You may also view a regional map of surrounding New Zealand tracks, campgrounds, and lodging. This thermal area full of hot pools, geysers, fumaroles, and mud pots can be explored on three successive loops for walks of 1.35 to 3.05 kilometers. This 1-kilometer walk in Rainbow Mountain Scenic Reserve goes to an overlook with views of a turquoise pool below vibrant cliffs. This 4.75-kilometer one-way route descends through a landscape of spectacular geothermal features like Frying Pan Lake, the largest hot spring in the world. Pair a walk down the valley with a Lake Rotomahana Boat Cruise for a memorable geothermal experience in Rotorua. Take a boat tour over the lake at the bottom of Waimangu Volcanic Valley, getting close to steaming vents and geysers right along the lakeshore for a unique on-the-water experience. 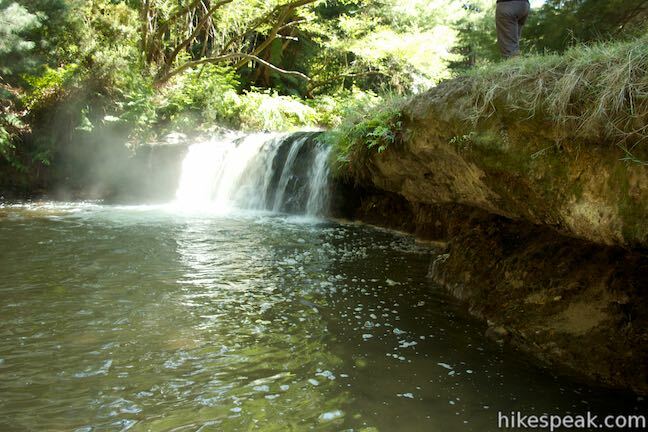 The cruise is reachable by bus or a hike down Waimangu Volcanic Valley. 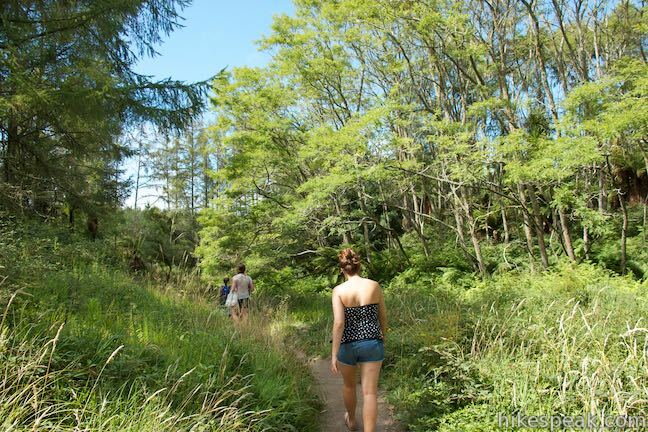 This 6.15-kilometer circuit near Rotorua provides a pleasant loop across lakeside beaches and forests, rising to a lookout over Blue Lake and nearby Green Lake. 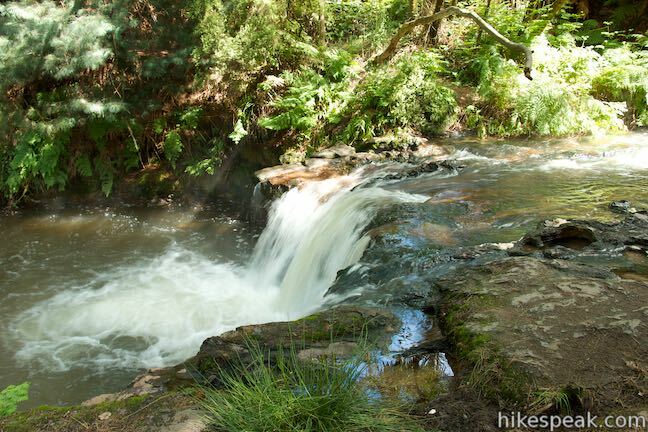 This scenic 3-kilometer walk through Okere Falls Scenic Reserve has views of multiple waterfalls, cascades, and pools on the Okere River near Rotorua. 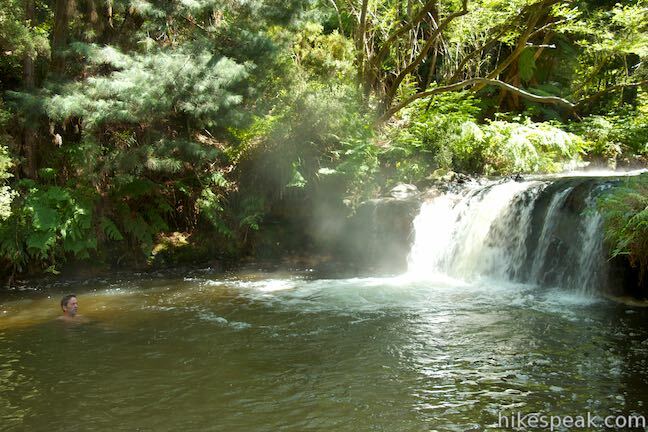 Take a memorable trip down the Kaituna River (Okere River) through Okere Falls Scenic Reserve that includes a thrilling plunge over Tutea Falls, the tallest commercially rafted waterfall in the world! 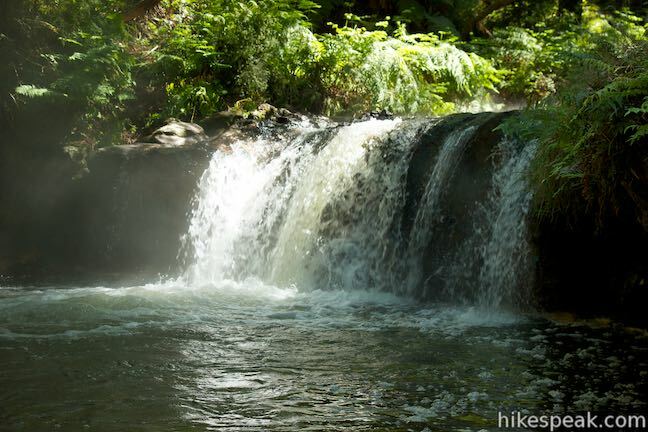 This 7.3-mile round trip walk follows the Waikato River from hot springs at Spa Thermal Park to the rapids and waterfall at Huka Falls in New Zealand's most visited scenic reserve. Set in a small town in the Bay of Plenty Region of New Zealand, this motor camp is half holiday park and half motor lodge, offering a variety of accommodations in a location that is both removed from busy tourist centers and close to lots of fun outdoor activities. 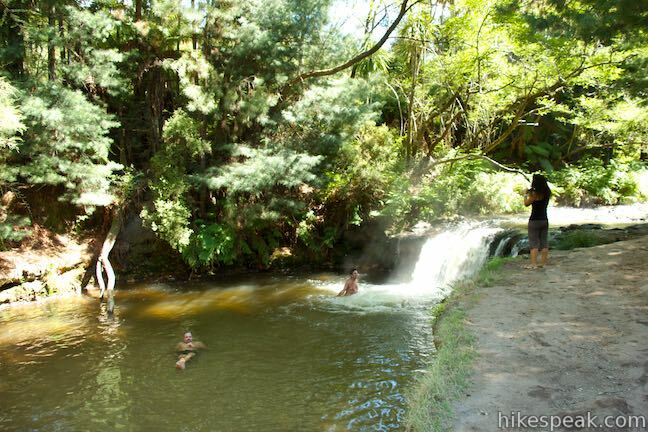 This holiday park has campsites, cabins, and motel accommodations in a fun setting near the center of Rotorua with amenities that include mineral hot pools.